You'll be £16.00 closer to your next £10.00 credit when you purchase Stanier. What's this? 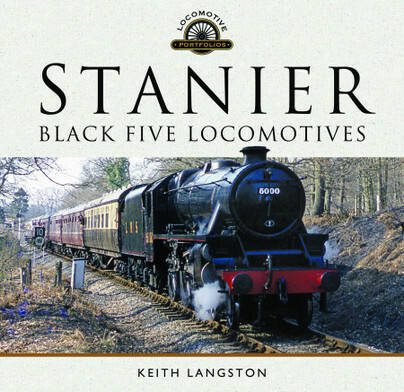 It is possible that in the history of British steam locomotives no class of engine was ever more universally popular than the Stanier ‘5MT’ 4-6-0 class, which were generally referred to as ‘Black Fives’. This informative book includes numerous images of the class at work, many of which are published for the first time. Introduced by the London Midland & Scottish Railway (LMS) in 1934 the building of the 842-strong class was shared between the locomotive works at Crewe, Horwich and Derby and also by the private builders Armstrong Whitworth Ltd. and Vulcan Foundry Ltd. With the exception of a pause in production during the war time years ‘Black Five’ locomotives continued to be built until May 1951, when the last example was out-shopped from BR Horwich Works. Only four examples of the class were named, but a fifth locomotive was allocated a name which it reportedly never carried. They were often referred to as the finest mixed-traffic locomotives ever to run in Britain. William Arthur Stanier joined the LMS in 1932 having previously served the Great Western Railway (GWR) at Swindon Works, doubtless his LMS 2-cylinder tapered boiler ‘Class 5’ 4-6-0 design reflected his Swindon experiences. This highly efficient and reliable general-purpose design (in several variants) could generally be seen at work over all of the former LMS network, from Thurso in the north of Scotland to Bournemouth (Somerset & Dorset Joint Railway) in the south of England. They became the ultimate go everywhere steam locomotives, working all manner of trains from slow goods to express passenger services. In 1967 just prior to the end of steam, British Railways remarkably listed 151 Stanier ‘Black Fives’ as ‘serviceable’ locomotives. A total of 18 Stanier ‘Black Five’ locomotives survived into preservation, with the majority of those having been returned to steam. Another photographic compilation, but what a collection! The history of W.A. Stanier’s Class 5 4-6-0 , one of the most successful British locomotives ever designed. With good route availability they eventually ran in most parts of Britain. The book covers the various builds of Black Five, and shows many of the detail differences. Based on a Great Western boiler Stanier added Walschaerts valve gear though versions with Caprotti and Stephenson’s also ran. Most pictures are black and white and the quality is very good. Tender details, BR shed codes and a listing of all the Fives make up the rear of this valuable resource for intending modellers. Another great work worthy of thickening the ranks of the series "Locomotive portfolios". This is an interesting addition to the tributes to this marvellous engine.